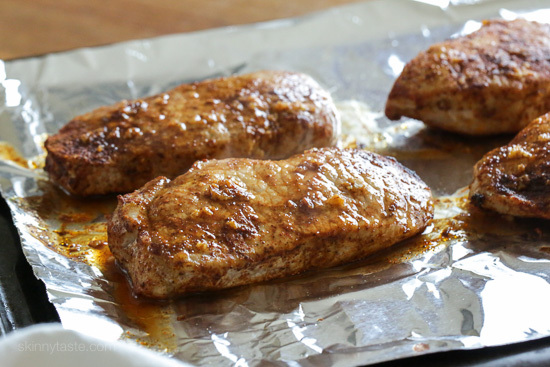 My husband’s least favorite meat is boneless pork chops, but he said these were amazing!! Very juicy and flavorful, so much so he did not need his beloved BBQ or hot sauce! Only difference I made was cooking them on the stove top for a faster turn around. Keeping this recipe in our permanent rotation! These are awesome! Both kids ate them up and mom and dad enjoyed the heck out of them. Will be permanately in our rotation. Thank you! I made this about a month ago and my man & I haven’t stopped talking about them!! DELICIOUS!! how high do you set the rack inorder to Broil the chops? I’m gonna use baby back rids for this one. Just happen to have them in the fridge. Can these be done in the oven on a sheet pan? Our broiler is out of commission! Not a fan of this recipe. So far the ONLY one that I haven’t enjoyed. I am a bit confused. I have more of a paste, that only covers one side of the pork chops at that. The picture shows mush more or a liquid marinade. What did I do wrong? They haven’t come out of the oven yet, so I cannot attest to the taste. Holy cow, Gina. I made this tonight and it was incredible. I didn’t have a lime so I subbed in the same amount of OJ and marinated for about 30 minutes. It was so easy and tender. I went 5 min on either side in the broiler and I think it was a bit much. When I make this again (which I absolutely will), I’ll try 4 on each side. SO GOOD AND EASY THOUGH. Thanks for this! Two thumbs up from the husband tonight! I made a mess of my broiler plan but it was worth it. So delicious!!!! Off to find my next Skinnytaste recipe! Are the pork chops broiled on high or low? These look great!! Grilling them tonight… I didn’t have any lime but I did have True Lime so I subbed a few packets of that ? How do you make the lime rice and do u have to use garlic…. just made this tonight on the grill and ooomg so easy and so yummy, grilled some corn alongside it and im in heaven! thank you Gina! I made this tonight practically dying from a bad cold. So easy I barely had to stand up to make it, and my ridiculously picky tween who “only” eats “pulled” pork ate the whole thing. Victory! I made this for dinner tonight and it was perfect! My picky kids even asked for seconds and my husband loved it too. Thanks for an easy recipe!!! Isn’t it great when the kids love it too! I made these last night and grilled them, they were delicious! Thanks for the recipe. Quick note: Sat fat grams are omitted in the nutrition info. Just had a serving of these and it will not be the last time; next time they will go on the barbecue though. However I was wondering how the recipe can be 5 Smart Points, since a 6 oz pork chops only are 2 SP? There isn’t anything else that adds on points as I can see. We just moved and I have no idea where my broiler pan is! Can I make these on a sheet pan? Any other recommendations? Gina– thank you for another winning recipe! Marinated these overnight and grilled them up quick on our grill pan. Served with a side of roasted Brussel Sprouts. Next time I think I will serve it with your cilantro cauliflower “rice”. This was my boyfriends favorite dinner in a long time. Thank you! Hi I don’t have lime, can i use lemon or something else? thanks! Hi! I don’t have lime, can I use lemon? I made these tonight and they were excellent! I couldn’t believe how much flavour was packed in! My husband and I both think these are our very favourite pork chop preparation! We both just love your recipes! Thank you! I love this recipe too! I made them last night but since meat cuts are different over here in Spain I ended up with smaller pieces of pork, so the marinade was a little scant. Next time I’m doubling up on it, as there’ll be definitely a next time, since these were excellent! Made these for the first time tonight. They were absolutely delicious with cilantro lime brown rice! Thank you for the recipes!! Made these tonight. You’re totally right… So flavorful and juicy! I had a question. When I made this, my marinade had no liquid like in the photographs, I squeezed in the lime juice, but the pork immediately soaked it up. I essentially have crushed garlic with dried spices. Thoughts? Perhaps your lime wasn’t juicy but it will still be fine. This looks delicious! 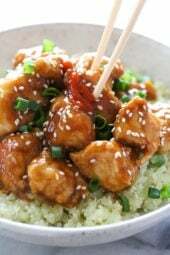 I can’t wait to make these this week with a side of cilantro cauliflower “rice”. I love pork but I don’t cook it enough! It’s so tasty and quick to prepare. Thanks for the inspiration! This recipe looks amazing! I'm making these for the third time tonight. The first time I made them as the recipe states and everyone loved them. I froze the leftover uncooked chops in the marinade and defrosted them two weeks ago. They were even better since they froze in the marinade and then marinated a bit more while defrosting. I cooked them in a cast iron pan. For today's chops I marinated them all day. Delicious! We love them with the Cilantro Lime Rice! I made this tonight with the cilantro lime rice. The flavors were awesome! I did marinate the pork for about 6 hours. Plenty of flavor for us…. of course I just threw it all in a Ziploc (didn't really measure the spices). This is a weekly dish that my ENTIRE family gets excited about when I announce, "we are having pork chops tonight!" – that includes two 4-year old's, a 6-year & 34-year old +1 (me). 🙂 Finally, a wonderfully flavorful dish that is HEALTHY & yummy! Thanks, Gina!! This was so tasty! So easy to make and very delicious! I love everything I have tried so far on this site. Thank you! This meal has become a staple in my household! I never really ate pork until this and am so glad I tried it! Even my picky son loves it. Thanks, Gina, for a super easy and delicious recipe. This was great! I added just a dash of rice wine vinegar to the marinade and were the best pork chops I've ever made. I just tried this tonight and I LOVED them!! 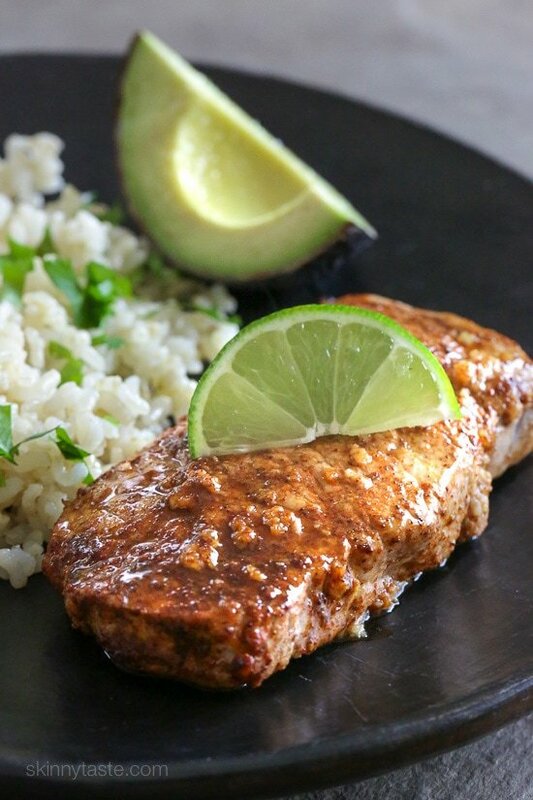 Great combination of spices and lime. I am doing ww and I love your site. I will be making this again!! I never comment, although I come to your website DAILY and have for years now for delicious recipe ideas…but I just HAD to comment that I thought they were amazing!! Mine marinated for a couple hours, next time I'll try all night. Thanks for a wonderful recipe!! I just finished having these for dinner this evening and I have to agree with an earlier post, that if I make these again I will definitely marinade overnight. Did not experience the heavenly flavor explosion many others did. It was really quite bland. Now I made the grilled chicken breasts with skinny pesto, tomatoes and mozzarella cheese last night, we were licking our fingers. That one was a big hit and we will be having them again later this week. I made these tonight and my hubby and I LOVED them! The flavour is heavenly and I cooked them for 11 mins total on 375. Perfectly moist and can't wait to try them again! We made these last night. I LOVED them. The marinade and spices made the meat so flavorful, you forget you're eating healthy. My husband isn't in love with lime so I may try with orange next time. Trying these tonight Gina! I hope the kids like it! Yum! Made this for lunch with some coconut lime jasmine rice and a tomato avocado salad. Delish…skinny taste has done it again!! 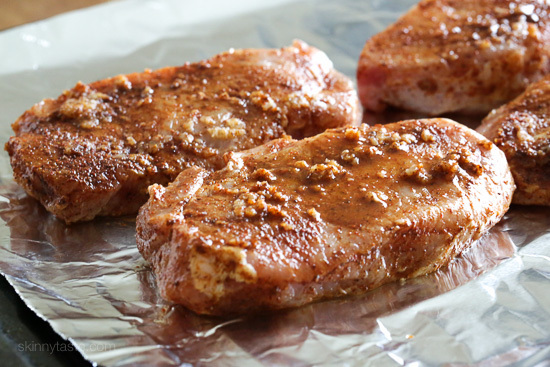 Have a son with severe dairy allergies… pork is marinating and its a "safe" food for him! Cant wait! So glad I found this site. I'm doing Weight Watchers and am having so much fun discovering new ways to eat. So thankful for all the yummy recipes. I'm doing this tonight with chicken breast. These were amazing my husband and I both loved them so much! These are excellent! I cooked on the stove top in a non-stick pan. I think next time I will broil and serve with a homemade mango salsa. Can't wait to have them again! Just tried this tonight with boneless centre cut chops. I actually froze the meat with the marinade and then just defrosted for dinner tonight. I broiled them in our toaster oven which took about 20 minutes in total (they were rather thin chops). Great flavour & couldn't be easier to make! This is definitely going into our regular rotation. Thank you! I only have the Pork Chops with bones. How long will I need to cook the Pork Chops with bones? Thanks! I made these, The first time I marinated the pork chops for an hour and a half. IMO the pork needed much much longer to soak up the flavor of the marinade. I left the two remaining porkchops to marinate overnight and made them the next day(I also doubled the amount of lime). Much tastier! I sliced the pork and make lettuce-tomato wraps. This recipe was simple and delicious. I had bought a pork tenderloin on sale and sliced it into chops. I made this last night. I marinated it overnight and then cooked it as directed in a broiler pan. I served them with baked sweet potatoes and roasted green beans. My husband, who is a healthy-food phobic who never gains weight, damn him, ate four chops because he liked them so much! could you make this with pork tenderloin? When I ran the ingredients through the tracker of the Weight Watchers web site, it shows the points as 4. You have the new points as 5 so I'm a little confused. 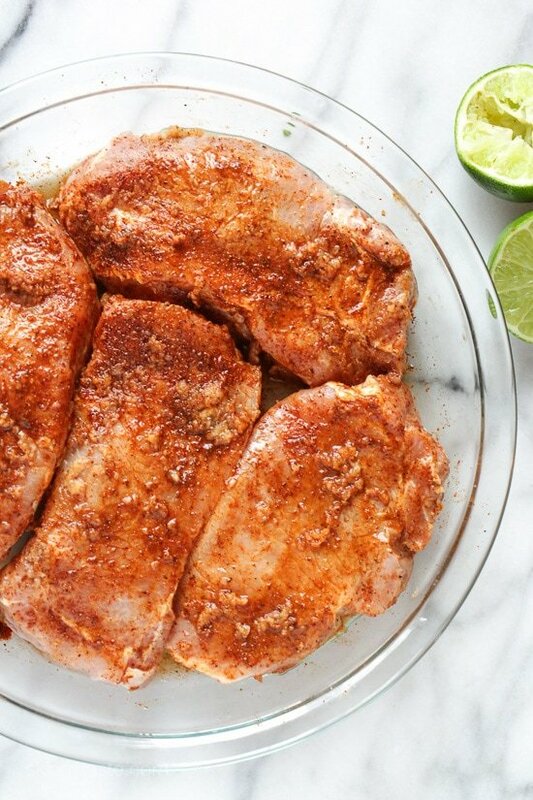 When you say to squeeze the lime and zest, is that over the chops after applying the seasoning? quick, easy and so tasty! thanks for another great recipe! I know is says 6 WW points but I am wondering if anyone knows how many calories that might equate to?? Either way this was amazing!! My first adventure making a pork chop and I am very proud!thank you Gina!! I made this last night and my VERY finicky husband liked it! I loved it and made some couscous to go with it…it was delicious!!!! 6 oz each raw, like most meat after it's cooked it is less. 4 or 5 oz each, I forget off the top of my head. Is each pork chop 6oz.? Because a total of 6oz. for all 4 would not be enough. Just seems like 6oz. is a lot for only 6 points. I am thinking of doing this with boneless skinless chicken breast on the grill. I dont do WW but count calories and fat. I love it that spices and herbs are FREEBIES!! I made this for dinner last night and OMG. So delicious. My husband and I just kept saying "mmmmmm" after every bite. I couldn't broil (still figuring out my new oven) but I pan-fried with a little non-stick spray and they came out sooooooo good. Thanks for this! how many ww plus points does it have? Broil on high, adjust time to your oven since they all vary. Just keep an eye on them so they don't burn. Do you broil on high or low? My oven has both options for broiling. Tried this today. All three girls loved it and wanted more. I served it with sweet potatoes that I "baked" in the crock pot. (Thanks for the baked potato tip) Thank you for your site. It has made WW very doable this go round! Karen- too funny!! Sounds like a wonderful combination!!! Hey, Gina! 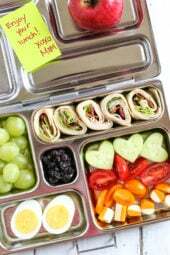 I am totally making these for supper tonight, love your blog! I just have a quick question. Do you brush off some of the excess spices and garlic before you broil the chops? I guess I thought there would be more liquid in the marinade so now I'm worried some of the spices are unevenly distributed! Started making this and realized I had no lime! Hope it turns out well with just the spices! Looks so great! I have liked your other recipes that I've tried, but this was kind of "meh". The garlic and especially the lime really overpowered everything else. I'm not sure why others said this smelled spicy, because it sure didn't to me. Unfortunately this one got dunked in some BBQ sauce, then it was decent. I just made this tonight – it was delicious! We marinated it for three hours and it was so good. This was very good! DH made it for us tonight. I was a little hesitant because the smell of the spices was overpowering, but in the end….delicious! Thank you, Gina! I served this for dinner with your Chipolte's Cilantro rice..WOWZERS! SO GOOD! Worth every one of those 10 points. Filling amd super tasty. I am a huge Chipolte fan so cannot wait to make my own burrito bowls at home for date night 🙂 Anyone who is considering this recipe, TRY IT! YUMM!!!! That's great news! If you can't make your family happy with dinner, it is very hard to stick to WW. I'm happy he liked it!! I made this last night with basmati rice-Super good! Hubby gave it 2 thumbs up. Thanks Gina! WW has been rough for me because of the dinners-hubby finds alot of the traditional recipes bland but so far everything I have made from your blog he's approved of. 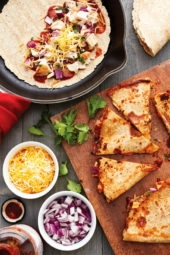 Thanks for the great site with these great recipes!! I made these and they were fantastic!! Thanks Gina for another wonderful recipe. Tried this last week and it has become a new favourite at our house! Thank you for posting this! Love it! This was very good. I thought it would be a little spicy for my little guy judging from the smell during cooking, but it wasn't spicy at all! It was great. I think I may try it on chicken, as my family always complain that pork chops are too dry (even when I cook them still a tiny pink!). Thanks for the recipe! Hi Gina, I made these pork chops with the basmati rice tonight and it came out awesome, and so delicious! I love the lime flavoring and the smell of the rice. I have always wanted to make that type of rice, Thank you! Yes, I just adjusted that. Thanks! what do you do with the garlic…..I assume you just marinate it with the lime…but it isn’t listed. Looks super great! yummy! I will try this one next week!! Mmmmm…I know what I`m making for dinner tonight. This looks amazing! !